Buying a gas generator is no easy task. Whether it’s new or used, a lot of work goes into finding the right generator for the job. The generator you choose could easily make or break a project. Buy one that’s underpowered? At best your productivity suffers, and at worst you put workers in danger. Buy an emergency generator that hasn’t been tested in months? It could fail just when you need it the most. Although shopping for a gas generator may seem like a herculean task there are ways to make it more manageable. Gas generators are expensive, and the urge to save a few (or a few hundred) bucks by going with a lesser known brand can be tempting but this is generally a bad idea. When evaluating a gas generator for sale one of the most important things you can look at is the manufacturer. Not only does this help pare down what would generally be a time-consuming search, but buying from known brands is practically a guarantee of quality. Brands like Cummings and Caterpillar have a rich history of manufacturing high-quality, long-lasting diesel generators. These aren’t the only good brands out there, but they are two of the most well-known, and they earned their reputation. Used generators can be just as reliable as brand new generators; you just have to know what you’re looking for. If you’ve already narrowed your search down to trusted manufacturers, then you’re off to a good start. Brand name alone isn’t enough to verify that a used generator is worth it though. You need to look at the history of the generator. What was it used for? How often was it used? Was it constantly under full load? The most important thing you should look for when buying a used generator is the maintenance history. If it doesn’t have one, you can stop right there. Buying a used generator without a full record of its maintenance history is risky. Manufacturers like Caterpillar will always have a recommended maintenance plan, so you can cross-reference that with the actual maintenance history to find out if you’re getting a well-maintained generator. You should always test a generator before you buy it, especially if it’s used. You should test it even if you’re looking at a pristinely kept generator from the best manufacturer. Generally, you’ll want to perform a load test. During a load test, an artificial and often heavy load will be applied to the machine to confirm that all of the parts are in working condition. Load tests are at their most useful when buying emergency generators. Emergency generators are used so infrequently that problems can easily slip under the radar. A load test will quickly expose any underlying issues. An undersized generator is nothing to mess around with. You may save a little money in the short term but long-term it is always a bad investment. So remember, finding the right size generator for your job is well worth the effort. Picking the right gas generator out of a sea of thousands isn’t easy. To be successful you should always buy from known manufacturers, consider used models, test thoroughly before purchasing, and find the right size generator for your project. At Depco Power Systems we stock new and used generators from industry-leading manufacturers. 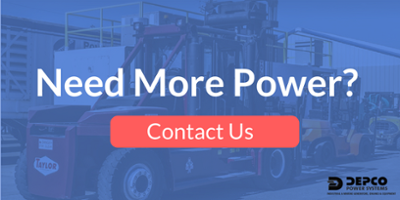 Please, contact us today so we can help you find the right generator for your job.